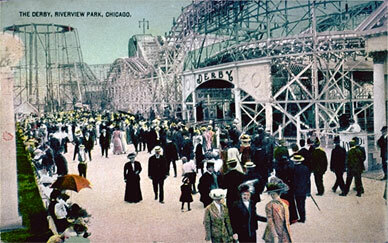 In 1909, the park built its first Racing Coaster. The Derby, engineered by famous designer John Miller, was incredibly popular right up until its destruction by fire in 1932. Throughout the rest of the teens, Riverview built at a frenzied pace. 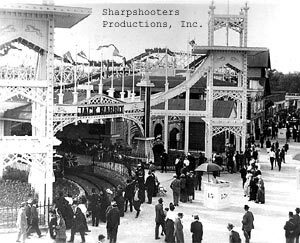 By the close of the decade, they'd built FOUR more roller coasters, the original Blue Streak, the Gee Whiz (aka Greyhound), the Jack Rabbit, and the Cannon Ball. 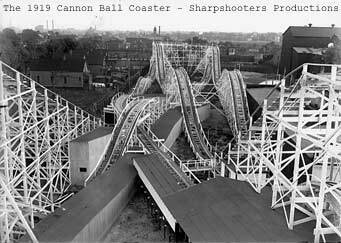 The Blue Streak came first in 1911, followed by the Gee Whiz in 1912, the Jack Rabbit racing coaster in 1914, and the Cannon Ball in 1919. 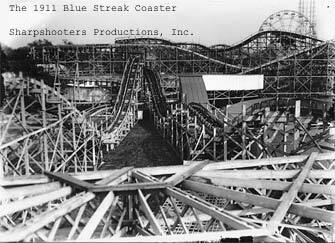 At right top is the original Blue Streak coaster. Below right is the entrance to the Jack Rabbit.